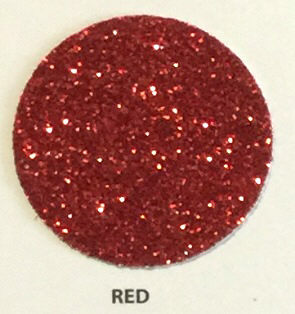 Select Size 6" x 14.75" 9" x 14.75" 12" x 14.75"
Fusible Glitter Sheets are real glitter flakes encased in high quality heat sealing adhesive and are useful for so many things. You can fuse it to fabric to add a wonderful sparkle look. It’s also great for appliqué projects. For those that have embroidery machines, a design can be embroidered for an added look. The great thing about Fusible Glitter is the fact that you can use almost all scraps so don’t throw them away. Use a regular paper punch to add decorative designs to your project. It’s also great for anything washable and dryable; shirts and pants to name a few. Just wash them inside out. It’s also great for paper crafts. Make your own cards for any occasion. To use, cover your glitter project with a thin dish towel, heat your iron to 330 – 335 degrees F. for 17-20 seconds and use firm, even pressure. NOTE: For those in the U.S. ordering a single sheet or two to try, I will ship first class and partially refund shipping charges. Overseas and Canada, please email me for shipping rates.